2016's drive was a big success thanks to our generous donors! Sign up below to be involved in the 2017 drive. A very special thank you to our volunteers and sponsors who helped to make the 2016 Thanksgiving Food Drive a huge success! 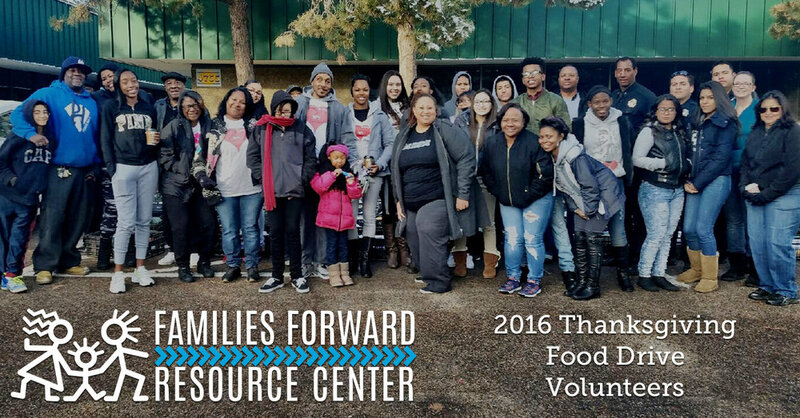 Every year Families Forward Resource Center conducts a small Thanksgiving Food Drive to help our families during the holiday season. We typically provide 250-350 families with food boxes and a turkey the weekend before Thanksgiving. We would like your help with collecting food items for the families. We invite schools, organizations, business, individuals and other families to help collect food items from their community. NO Frozen Items, NO Perishables, NO Expired Foods - MONETARY DONATIONS ARE NEEDED! Sorting: November 14th, 15th,and 16th (10-4pm) @ FFRC's Montbello Location and the Thanksgiving Drive will be November 17th (10-2pm) @ FFRC's Montbello Location: 12000 E. 47th Ave. Denver, CO 80239. Thank you! We will be in contact to help you through the donation collection process. Please inform us of when you'll be available to volunteer within these dates and times: November 15th,16th,and 17th 10-4pm and November 18th 8am-2pm. Thank you! We will be in touch shortly to confirm your volunteer time. It's thanks to your support that we are able to serve the families in our communities.